Super slim slate set to sizzle? The wildly impressive looking Sony Xperia Tablet Z has formally been shown off at MWC 2013, and the 10.1-inch device is taking on the likes of the iPad and Galaxy Tabs on not only specs but also price. Sony's latest Android tablet was announced in January, and the headline specs haven't got any less impressive in the past few weeks. The Xperia Tablet Z's display is a 10.1-inch WUXGA display - that's 1920 x 1200 - powered by a quad-core Snapdragon S4 Pro processor and a whopping 2GB of RAM. Also noteworthy is that this tablet is water resistant, making sure an occasional rain splot doesn't have you scurrying for a very large bag of rice. Given its claim to be the "most premium" Android tablet around, the Sony Xperia Tablet Z price is perhaps the most surprising bit, with the Wi-Fi only version priced at £399/$499 and the 4G/LTE offering at £499/$599. The tablet is, ahem, slated to appear in the spring in the UK, and, dare we say, there will be a legion of Sony fans champing at the bit until then. 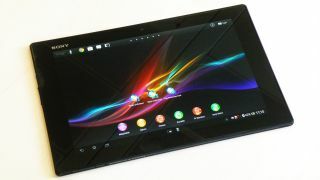 TechRadar has had some time with the device, so if you want to know more, check out our Hands on: Sony Xperia Tablet Z review.